The latest message from Tom Zirbel — no, he’s not already hiding in Peru or holed up in a cave watching old VHS tapes of LeMond winning his first tour — was funny in a cool sort of way. Nailed for the steroid DHEA and waiting for the dice to roll on his B sample, Zirbel is keeping a positive frame of mind. Guilty or the victim of a horrible lab accident, he is in chill mode. 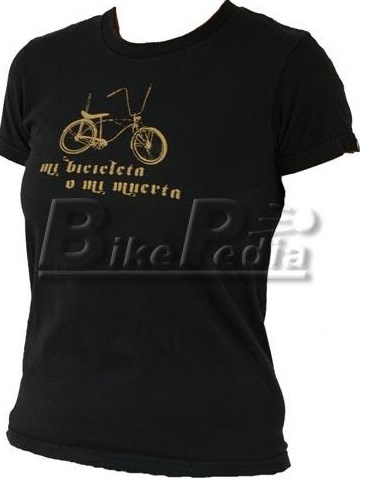 Case in point, his current choice in cycling t-shirts: a lowrider graphic with the admirable statement “Mi bicicleta o mi muerte” (my bicycle or my death in Spanish). The US Anti Doping Association (USADA) usually hands out a two year suspension but hey, maybe they’re cracking down and death is a possibility. In any case, the instantly-former rider for the US-based Bissell Pro Cycling team is keeping his spirits up no matter what happens with his racing career. “If that is taken away from me, I’m not going to give up on life or play the victim,” said Zirbel. We applaud the sentiment, Tom. Get on your bicicleta and go for a ride. « Armstrong to ride Tour of Flanders, Liege-Bastogne-Liege. Builds cobblestone training road in Austin. Matt, I actually like this piece, except for the “switched from Steroids to Ecstacy” crack. Do you take Ecstacy?–Tom doesn’t. Try this: If, somehow, the “WADA accredited lab at the University of Utah” (you’re giving them too much credit) botched this test from the git-go, notice how all of Tom’s answers and statements are exactly where they should be? Innocent people, unless they’re nuts, don’t very often confess. More likely, you’ll hear confused bewilderment, followed by denial,anger,then sadly, lawyers. It’s too bad you don’t come down on the other side of the fence. Believe me,if you knew Tom Zirbel, you would.